Lufthansa is saying goodbye to its Boeing 737 fleet after 48 years. This marks the end of an era for Lufthansa, spanning almost 50 years. A B737-300, with registration D-ABEC (“Karlsruhe”), flew from Frankfurt to Hamburg on 31st October, special flight LH9922, where Lufthansa’s B737 fleet is to be officially bid farewell during a joint event with Lufthansa Technik. After a special ceremony, Captain and Fleet Commander Ulrich Pade and his crew will be flying back to Frankfurt, with a group of media representatives as well as a number of employees on board. “Lufthansa has always taken innovative approaches to cater the customers’ needs and to take advantage of market opportunities, which is why we played a key role in the B737’s creation and development. We will continue to pursue this innovative approach with the latest generation of aircraft,” said Harry Hohmeister, Member of the Executive Board and Head of Hub Management. Over the decades, Lufthansa has had a total of 148 B737 of almost all generations. At the beginning of the 1960s, the then Chief Executive Officer of Lufthansa Technik, Professor Gerhard Höltje, pushed the project forward and supported the joint development of a short and medium-haul jet with Boeing. The cabin design and the positioning of the engines under the aircraft’s wings were based on the long-haul aircraft of the time. A 1960s children’s book described the Boeing 707 as the father and the B727 as the mother of the small jet named “Bobby”. This name caught on. 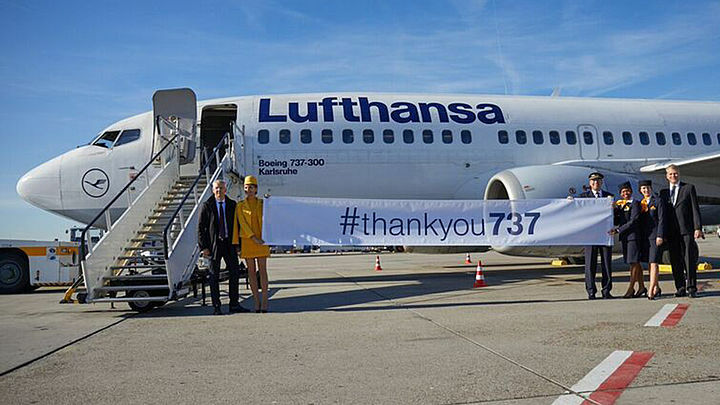 “The B737 has always been called “Bobby” by Lufthansa employees and aircraft fans. Many passengers and employees associate a very special time with this aircraft model. We want to thank the B737 for almost 50 years of reliable and successful operations,” said Klaus Froese, CEO Lufthansa Hub Frankfurt. With the start of the winter schedule, all six remaining B737-300 aircraft had its last commercial flights on October, 29. The planes will be transferred to Florida in the coming weeks, where they will be resold. In future, Lufthansa will offer continental services with a single type of aircraft, which will result in synergies in various areas, such as pilot licensing, cabin crew and planning and provision of spare parts. The Lufthansa A320 family currently consists of around 150 A319, A320 and A321 aircraft and also includes four aircraft of the latest generation – the A320neo. On 19 February 1965, Lufthansa was the world’s first purchaser of 22 Boeing 737-100s. Almost three years later, on 4 February 1968, Lufthansa landed the first B737 in Hamburg. Within a short time, the Boeing 737 became the normal size for short-haul aircraft. Besides the B737-200 in various passenger and freight versions, the first B737-300 was delivered to Lufthansa in 1986, which offered a high level of comfort, efficient fuel consumption and low noise levels compared to other aircraft of the period. In May 1988, the first co-pilots were trained to fly the B737, which was also the first aircraft to witness to the reunification of the two Germanys as it was the first aircraft to land in the former GDR at Leipzig Airport. A little later on 2 October 1990, the first Lufthansa flight with the B737 “Sindelfingen” took off to West Berlin. In the summer of 2016, the B737 was given one last great honor when the B737 with registration D-ABEK was given the colors of the “Fanhansa” and flew to France with German national football team on board.